Saudi Arabia is set to become home to the largest hotel in the world with a whopping 10,000 rooms. 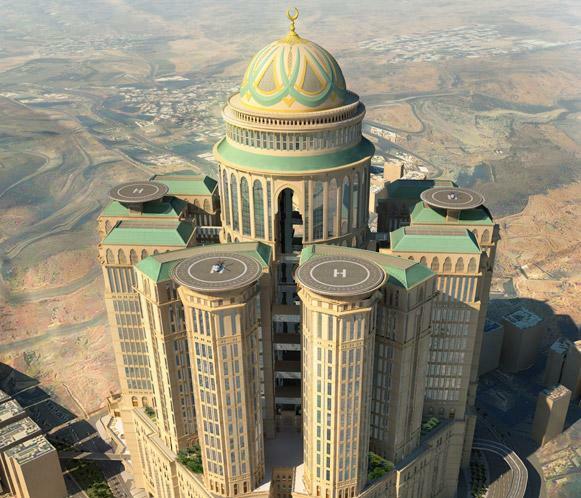 To be built just two kilometers away from the site of Mecca, which attracts about two million Muslim pilgrims a year for the annual Hajj, the $3.5 billion Abraj Kudai will become the world’s largest hotel when it opens in 2017, reports Arabian Business. Once complete, the mixed-use development project will span 1.4 million square meters and feature a hotel that can fit the population of a small town, shopping mall, full-size convention center, rooftop helipads, food court and bus station. Twelve towers will make up the building with certain spaces geared to accommodate Hajj visitors, house prayer halls and dining spaces. Renderings reveal a series of monolithic towers encircling a main domed tower, designed to hearken a traditional desert fortress. According to Arabian Business, 10 towers will provide four-star accommodations, while two will be reserved for their most well-heeled clientele offering five-star amenities. London-based firm Areen Hospitality has been tapped to design the rooms and hotel interior.